On tap at TCBW 2018. Pours golden yellow colour with quite high white head. Juicy and very fruity aroma. Very fruity beginning. The middle stage of the taste might be a bit boring, but all the fruits and citrusses come back in the end. Light bodied, well drinkable IPA. Borefts IX. Day 1. Keg. Light haze on this gold beer, small pale cream colour head. Light palate, semi dry, decent fine carbonation. Nice light creamy sweet malts. Good piney hops and mellow hop spice. Nice mix of orange and grapefruit citrus with an underpinning of tropical fruits. Light crisp finish. Nicely balanced and crushable. Tap at TCBW 2018. Hazy amber beer, white head. Tropical fruits and biscuity malt, citric-bitter finish. Nice. Tap at beerlovers bar. Pours unclear yellow blonde. Small white head. Smell is heavy, malty. Bit hops ( not overly fruity tho). Taste is sharp, bitter. Intense, full, malty, loads of hops, tad creamy. Noticeable alcohol, but not boozy. Draft. An unclear yellow beer with a lazing white head. The aroma has notes of lemons, straw, hops, and citrus fruits. The flavor is sweet with notes of exotic fruits, hops, straw, spices, and malt, leading to a bitter finish. Keg (TCBW 2018). Hazy deep amber color. Medium size, thick off-white head, stays. Sweet, mango, tropical fruits, citrus in aroma. Tropical fruits, citrus, mango in taste. Alcohol is covered. Pleasant in mouth. Solid brew. Tap at TCBW 2018. Pours hazy golden. Aroma is sweet, fruity, citrus, mango, pineapple. Flavor is sweet and bitter, hoppy, fruity, citrus, pineapple. Covers alcohol well, finish has some dry bitterness. Overall: good. På fat på RØØR. Uklar gul med tykk hvit skum. Aromaer av aprikos, frisk svette og lime. 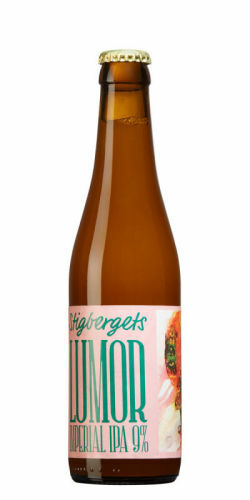 Smaker av sitron sherbet, kandiserte ananas, med en lys bitter ettersmak. Veldig søtt. Tap @Scurreria in Genoa-Italy. Misty and bright orange skin pour, medium creamy head with a decent retention. Nose: passion fruit, papaya, rasperries and tropical. Sour aroma of tropical is pretty present. Mouth: soft carbonation a bit below expectations, anyway it’s ok. Easy going for being a DIPA, the dunk pops up in the aftertaste with a firm resinous overall. A bit different but tasty.